The Northern Irishman endured a frustrating day at the Dubai Desert Classic. 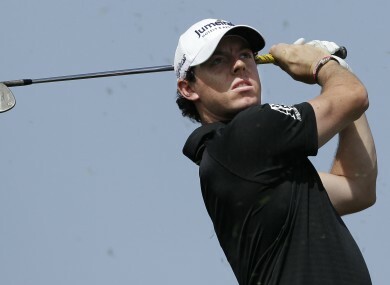 McIlroy's mistakes allowed Westwood to gain a one-shot lead. LEE WESTWOOD TOOK advantage of some shaky play from Rory McIlroy and Thomas Bjorn, shooting a 5-under 67 for a one-stroke lead on Rafael Cabrera-Bello after the third round of the Dubai Desert Classic. Westwood was three shots behind overnight leaders McIlroy and Bjorn at the start of the round but closed the gap with three birdies in his first four holes. The third-ranked Englishman birdied the 13th for a share of the lead with Bjorn and led when the Dane bogeyed the 15th. Joining Cabrera-Bello at one-shot back were Stephen Gallacher (68) and Marcel Siem (68). McIlroy, who struggled early, finished with a 72 to trail Westwood by two shots. Bjorn was three behind the leader with a 73. Coming into Saturday, it appeared Westwood’s biggest challengers this weekend would be US Open champion McIlroy and Bjorn, who beat Tiger Woods in 2001 to take the Dubai title. But McIlroy’s tee shot on No. 7 went into the water for his first bogey. He had three more bogeys on the back nine. With McIlroy faltering, it seemed the 40-year-old Bjorn would take advantage. He took the lead with a birdie at No. 7 and added another birdie on No. 10. But he struggled on the remainder the back nine after a tee shot in the bunker led to a bogey on 15. Bjorn added two more bogeys in his last three holes. McIlroy stayed in contention, making three birdies on the back nine, including the 18th. McIlroy said he had a similar experience in Hong Kong where he shot a 65 to win the tournament, so he’s confident of claiming his first victory in Dubai since 2009. Joining McIlroy were Martin Kaymer (70), Scott Jamieson (70) and Joel Sjoholm (66). Bjorn was in a three-way tie for ninth with George Coetzee (69) and Ben Curtis (67). With 21 European Tour titles, Westwood is a veteran among the three players who trail by one shot. They’ve earned a combined three titles. On Sunday, Westwood will play alongside the 148th-ranked Gallacher and 223rd-ranked Siem — setting up an underdog scenario like last month when Robert Rock beat Tiger Woods in Abu Dhabi. Westwood will tap into his final-round experience on Sunday. “Yeah, I know how to play with the lead. What did I win, four times last year?” Westwood said, with a wry smile. “When I get a chance, I’m pretty good at finishing off. I’ve won (38) times (worldwide). Email “McIlroy's slip-up allows Westwood to gain advantage”. Feedback on “McIlroy's slip-up allows Westwood to gain advantage”.